Background: The pressure of caring from patients with cancer can be a form of stress and influence caregivers’ daily life and health. Considering the problems caused by the burden of cancer for patients and their families, this study was aimed to investigate the correlation between perceived social support and resilience in the family of patients with cancer. Materials and Methods: This descriptive-correlation study was conducted on 114 family caregivers of patients with cancer. Data collection tools were Connor-Davidson Resilience Scale (CD-RISC), Multidimensional Scale of Perceived Social Support (MSPSS) and demographic questionnaire. The data were analysed through SPSS software (version 21) considering a significant level of 0.05. Results: The mean resilience score was 90.56 ± 9.64 and the mean social support score was 73.07 ± 11.87. The highest social support score was from the family social support sub-scale (26.46 ± 2.91). There was a positive correlation between resilience score and social support score of caregivers (p=0.001, r=0.32). Sub-scale of family social support showed the highest correlation with resilience (p=0.00, r=0.50). Conclusions: The results indicated that increased social support improves the resilience of caregivers of patients with cancer. Families of patients and caregivers should be trained to provide timely support. According to these results, it is recommended that health care providers, and especially nurses, use strategies to promote perceived social support and resilience in order to improve the health of patients and their caregivers. The family of patients with cancer is one of the most important groups providing services and care to these patients . In the process of cancer treating and its complications, the responsibility for home affairs, emotional protection, nutrition provision, the provision of safe care and economic support are the responsibility of the family of patients with cancer . The increasing population of patients with cancer around the world shows the need for widespread attention to this disease . Family caregivers provide most of the needed services for patients with cancer; however, health care systems rarely prepare them for this role . The family of cancer patients experiences specific psychological stress . Caring for chronic care creates chronic stress for the caregiver and limits his ability to provide full, quality care, ultimately threatening his physical and mental health . Family caregivers experience many psychological stresses and become more stress-affected than patients themselves . The high level of psychological burden that is important to the family of patients with reported cancer because it affects the quality of patient care under longterm pressure . Perceived social support is the most important coping force for a successful person to deal with stressful situations, which facilitates patient satisfaction [9,10]. Resilience reflects positive adaptation in the face of unpleasant issues, flexibility, mental health, the ability to live a healthy life despite the pressures of life [11,12]. Radiation is very important in the early diagnosis of cancer, which can have a protective effect against the psychological and social harm of the disease . The results of a study on patients with cancer showed that the greater the level of perceived social support, the greater the resilience of patients . Since the cancer patient is one of the most important groups in providing services to patients, family members are confused in accepting this role without receiving the necessary guidance and support. Patient caregivers should be psychologically supported in order to take appropriate care of the patient [1,15]. The results of a study in Singapore indicated that perceived social support is associated with the resilience and burden of disease in caregivers of elderly patients . In addition, another study showed that family caregivers with high resilience are more likely to cope with problems and caregivers . A study on Alzheimer's caregivers also found that stress had a negative effect on the resilience of caregivers, but caregivers with high perceived social support showed the better resilience . Providing care for patients with cancer is complex and requires specific solutions. Family members often play a role in caring with little or no readiness and without regard to having sufficient knowledge, resources or skills in this regard. As a result, the patient care process can have a significant impact on the physical and mental wellbeing of family caregivers and the health outcomes of patients. Also, due to the high prevalence of cancer in Iran  and around the world , high mortality and irreversible physical, psychological, social and economic consequences of cancer , there is no study in Iran on family caregivers. 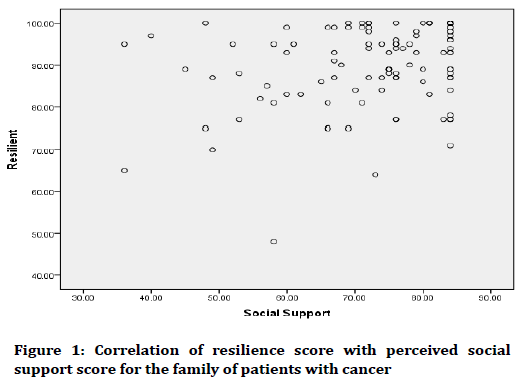 This study was aimed to determine the correlation between perceived social support and the resilience of the family of patients with cancer in selected hospitals in Tehran in 2018. This descriptive correlational study was conducted on family caregivers of patients with cancer who referred to hospitals clinics in one of the Iranian capital's universities. The research setting included the clinics of Taleghani, Shohadaye Tajrish, Imam Hussein, Modrres and Masih Daneshvari hospitals of Tehran. The inclusion criteria were at least 18 years of age, first-degree family members (father, mother, child, spouse, sister and brother) and confirmation of the role as family caregiver (providing physical and mental care to the patient at home without charge). Exclusion criteria included a caregiver's history of providing care to another patient with another cancer. According to previous studies, based on the probability of type 1 error (α), the power (β-1) of 0.9 and the correlation coefficient (r) of 0.3, the sample size was calculated 114. The data collection forms in this study included three sections. The first section included the demographic characteristics of the caregiver (age, gender, marital status, educational level, employment status, income status, family history of cancer and history of chronic disease) and the patient (age, gender, type of cancer, having insurance and a period of diagnosis). In the second section, a multi-dimensional social support perceived questionnaire (MSPSS) was used to measure perceived social support. This questionnaire was developed by Zimet et al. to measure perceived social support from the family, friends and important individuals of one's life. The questionnaire has 3 subscales of family, friends, important people and 12 subjects in total. Each item is consisted of seven-level Likert options (totally opposite=1 to totally agree=7). The score for the questionnaire is from 12 to 84, obviously the higher the score points, the greater the perceived social support . Salimi et al. have achieved the validity and reliability of this tool in Iran, so that its validity was declared with proper factor analysis and its coefficient of reliability was 0.86, 0.86 and 82 for each dimension, respectively . To measure resilience of caregivers in the third part of the information form, the Conner Davidson Resilience Scale (CD-RISC 2003) was used. This questionnaire has 25 questions to measure resilience in different individuals. The response spectrum is Likert type and in the form (completely false=0 and completely true=4). The score for this questionnaire is 0 to 100. The cut-off point for this questionnaire is 50, in which, the higher the score more than 50, the higher resilient of patients . Mohammadi et al. standardized this tool in Iran. The validity of this tool was declared acceptable. Also, the reliability of this tool was confirmed by Cronbach's alpha coefficient of 0.89 . Sampling method was multi-stage. At first, the centers that had chemotherapy clinics were selected. Then in each center, special quota was considered in terms of the number of referrals. Finally, purposive sampling was done in each centre; sampling was continued until the number of samples needed. The data were analysed using SPSS-21 and the normal distribution of the data was investigated by Kolmogorov-Smirnov test. Inferential analysis was performed using independent t-test and analysis of variance One-way and Pearson correlation. In all tests, the significance level of p<0.05 was significant. In this study, according to the inclusion criteria, 114 family caregivers of patients with cancer were included in the study. The age range of caregivers in this study was 20-69 years and the age range of patients was 27-76 years. The mean age of patients and caregivers was 54.97 ± 14.92 and 41.32 ± 11.20, respectively. Fifty-seven caregivers (50%) were the children of patients, ninetyfive caregivers (83.3%) were married and seventy-two caregivers (63.2%) had not history of cancer in their family. The results showed that the mean score of social support perceived by caregivers was 73.07 ± 11.87 and the mean caregivers' resilience score was 90.56 ± 9.64. Also, perceived social support of the family (26.46 ± 2.91) had the highest score among the sub-scales of social support perceived by caregivers. T-test and one-way ANOVA were used to compare the mean of social support perceived scores and the resilience of caregivers by gender, education, employment status, income, family history of cancer, and duration of diagnosis, in which there was no significant difference (p>0.05). Comparison of the mean score of social support perceived by marital status was statistically significant (p=0.01) using one-way ANOVA, so that the perceived social support score in married people was higher. Independent T-test showed that the mean score of perceived social support and resiliency of those who had insurance had a significant difference (p=0.02) compared with those who had not insurance, so that those with insurance mean score of resilience and perceived social support were higher The results of one-way ANOVA and Tukey's post hoc test showed that caregivers of patients with brain cancer had less resilience than other cancers (p=0.01) (Table 1). The age of the patient was negatively correlated with the social support score of caregivers (r=-0.21, p=0.02), while the patient's age increase, the level of perceived social support by caregiver decreases. Table 2 shows the results of the Pearson correlation test. According to this table, the positive correlation of the resilience score with the perceived social support score and the sub-scales of the family and the important people can be observed. Figure 1 also shows the correlation of the perceived social support score with the resilience score of caregivers. The results of this study showed that there was a significant relationship between perceived social support and resilience in family caregivers of patients with cancer. This study was able to confirm the hypothesis that a high level of perceived social support is effective in protecting and preventing the family and the patient from the adverse psychological effects of the cancer by promoting resilience. Although the correlation between perceived social support and resilience in patients has been confirmed in several internal and external studies [14,24], but according to studies conducted in Iran, this study has not been studied in family caregivers. Also, foreign studies conducted in this area are limited. As in the present study, Ong et al. in Singapore reported a positive relationship between perceived social support and the resilience and burden of disease in caregivers of elderly patients . In this regard, Wilks et al. revealed that perceived social support moderates the relationship between stress and resilience in caregivers of Alzheimer's patients, so that the high level of perceived social support reduces the negative impact of stress on caregivers' resilience and increases the resilience of caregivers . The present study showed that the mean perceived social support of the family was higher than the other two dimensions (friends and important people of life). The results of the study by Lakzai et al. were consistent with these results . In contrast, Azadi et al. have not confirmed this finding . In the study of Azadi et al., social support scores were found to be greater in important people of life. The probable cause of this difference can be justified by the difference in the studied population. The study of Azadi et al. has been conducted on young students and young people, while the study was conducted on caregivers of patients with cancer aged more than 50 years in average. Obviously, at an early age, one's relationships become narrower, and people receive more social support from the family . In the present study, a significant relationship was found between marital status and perceived social support. The level of social support perceived by married people was higher. The results of Lakzai et al. were consistent with the present study . The reason for the reduction of perceived social support in single, divorced, and deceased spouses may be the disappearance of a supportive system in the family and the emergence of isolation and loneliness in individuals that threatens their mental and physical health. The relationship between spouses is different from that of family members, physicians and nurses with the patient. The presence of a spouse as a person who increases the sense of solidarity of an individual to others can affect the health and performance of the individual as well as the quality of perceived social support. The mean resilience score of caregivers in patients with brain cancer was lower than the rest of the cancers. Brain cancer is one of the deadliest diseases, in which its treatment for patients and their families has a wide physical, psychological and financial burden . Considering the many complications of malignant brain tumors and the short-term survival of these patients, the results of the study are justifiable. The results of this study showed that in those who were insured, the level of resilience score and social support score of caregivers was higher. This finding was also documented in the study of Jafari et al. . Losing insurance and lack of treatment costs are worrying factors for cancer patients. Individuals with more direct and indirect financial needs may require more support, and because these expectations and protections are not met, they see their needs unresponsive and have less perceived social support. Ultimately, having insurance is a form of financial support and can subsequently affect the perception of the patient and his/her caregiver regarding social support as well as resilience. There is a significant correlation between resilience with perceived social support in caregivers of patients with cancer. The needs of patients with cancer are different from other patients in many ways, which poses challenges to caregivers. Using the results of this research for planning perceived social support from patients and their families to increase resilience and also to educate all students and providers of health services, especially nurses are important. This study was extracted from the master's degree thesis approved by ethics committee of Shahid Beheshti University of Medical Sciences with code IR.SBMU.RETECH.REC.1396.1288. The authors would like to thank the cooperation of all the participants in this study as well as the research deputy of Shahid Beheshti University of Medical Sciences. Kent EE, Rowland JH, Northouse L, et al. Caring for caregivers and patients: Research and clinical priorities for informal cancer caregiving. Cancer 2016; 122:1987-95 . Rha SY, Park Y, Song SK, et al. Caregiving burden and the quality of life of family caregivers of cancer patients: The relationship and correlates. Eur J Oncol Nurs 2015; 19:376-82 . Siegel RL, Miller KD, Jemal A. Cancer statistics, 2019. CA Cancer J Clin 2019; 69:7-34. LeSeure P, Chongkham-ang S. The experience of caregivers living with cancer patients: A systematic review and meta-synthesis. J Personalized Med 2015; 5:406-39 . Northouse L, Williams AL, Given B, et al. Psychosocial care for family caregivers of patients with cancer. J Clin Oncol 2012; 30:1227-34 . Mcdonald J, Swami N, Pope A, et al. Understanding Quality of Life among Caregivers of Patients with Advanced Cancer: A Qualitative Study within a Trial of Early Palliative Care. Palliative Med 2016; 30: P155 . Hodges L, Humphris G, Macfarlane G. A meta-analytic investigation of the relationship between the psychological distress of cancer patients and their carers. Soc Sci Med 2005; 60:1-12 . Reblin M, Clayton MF, Xu J, et al. Caregiver, patient, and nurse visit communication patterns in cancer home hospice. Psycho-Oncol 2017; 26:2285-93 . Feeney BC, Collins NL. A new look at social support: A theoretical perspective on thriving through relationships. Pers Soc Psychol Rev 2015; 19:113-47 . Ong HL, Vaingankar JA, Abdin E, et al. Resilience and burden in caregivers of older adults: Moderating and mediating effects of perceived social support. BMC Psychiatry 2018; 18:27 . Kong L, Fang M, Ma T, et al. Positive affect mediates the relationships between resilience, social support and posttraumatic growth of women with infertility. Psychol Health Med 2018; 23:707-16 . Scoloveno R. A concept analysis of the phenomenon of resilience. JNC 2016; 5:2167-1168. Ye ZJ, Liang MZ, Qiu HZ, et al. Effect of a multidiscipline mentor-based program, Be resilient to breast cancer (BRBC), on female breast cancer survivors in mainland China-A randomized, controlled, theoretically-derived intervention trial. Breast Cancer Res Treat 2016; 158:509-22. Vartak J. The role of hope and social support on resilience in cancer patients. Indian J Mental Health 2015; 2:35-42 . Sajjadi M, Rassouli M, Abbaszadeh A, et al. Lived experiences of “illness uncertainty” of Iranian cancer patients: A phenomenological hermeneutic study. Cancer Nurs 2016; 39:E1-9 . Dias R, Santos RL, Sousa MFBD, et al. Resilience of caregivers of people with dementia: a systematic review of biological and psychosocial determinants. Trends Psychiatry Psychother 2015; 37:12-9 . Wilks SE, Croom B. Perceived stress and resilience in Alzheimer's disease caregivers: Testing moderation and mediation models of social support. Aging Ment Health 2008; 12:357-65. Mohammadian M, Salehiniya H, Mohammadian-Hafshejani A. Some facts on incidence and mortality of cancer in Iran. Iran J Public Health 2017; 46:1446-7 . Trama A, Botta L, Steliarova-Foucher E. Cancer burden in adolescents and young adults: A review of epidemiological evidence. Cancer J 2018; 24:256-66 . Zimet GD, Dahlem NW, Zimet SG, et al. The multidimensional scale of perceived social support. J Pers Assess 1988; 52:30-41. Salimi A, Jokar B, Nikpoor R. Internet connections in life: The role of perceived social support and loneliness. Q J Psychol Stud 2009; 5:81-102 . Connor KM, Davidson JR. Development of a new resilience scale: The Connor‐Davidson resilience scale (CD‐RISC). Depress Anxiety 2003; 18:76-82 . Mohammadi M, Jazayeri A, Rafie A, et al. Resilience factors in individuals at risk for substance abuse. J Psychol (Tabriz University) 2006; 1:203-24. Lakzai H, Mansouri A, Bamari F, et al. An Investigation of the relationship between perceived social support and resilience in diabetic patients referring to Ali Asghar clinic of Zahedan. J Diab Nurs 2015; 2:16-24. Azadi SAH. The correlation of social support, tolerance and mental health in children of martyrs and war-disabled in universities of Ilam. JMERC 2011; 3:48-58 . Islami F, Miller KD, Jemal A. Cancer burden in the United States—A review. Ann Cancer Epidemiol 2018; 2 . Jafari S, Mohtashami J, Alaee Karahroudi F, et al. Perceived social support and its correlated factors in adolescents with chronic disease. J Hayat 2016; 22:65-78 . Citation: Nasrin Fekrat Salim, Fariba Borhani*, Mahsa Boozari Pour, Mehdi Khabazkhoob, Correlation between perceived social support and resilience in the family of patients with cancer, J Res Med Dent Sci, 2019, 7(1): 158-162.